You want to short a stock but don't want to have your face ripped off by an upgrade or early earnings announcement? The bear put spread, also known as a put debit spread or put vertical, is a way to take a slightly bearish bet that the underlying stock will decline. 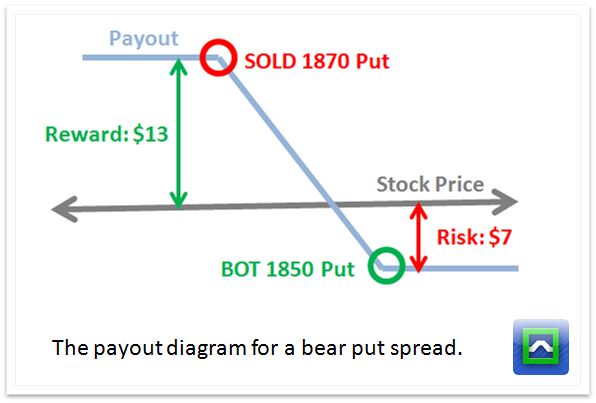 A bear put spread is constructed by purchasing one put and selling a different put, with the only difference between the two option contracts is the strike price. In this trade, you will always buy the put that has a higher delta, meaning it will always be at a higher strike price. 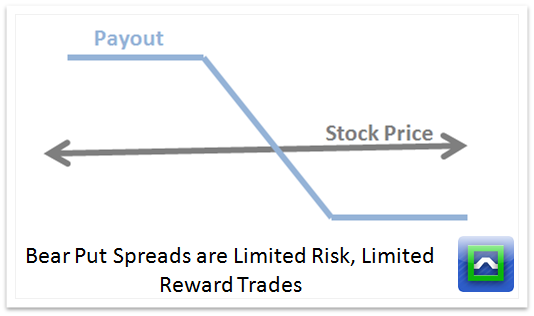 Unlike a simple put buy, bear put spreads have a short option at a lower strike that caps your reward but also reduces the net cost of the trade. You want to take this trade if you think the underlying stock can go lower, but not crash. If you think the stock is going to crash, you should be loading up on put buys. 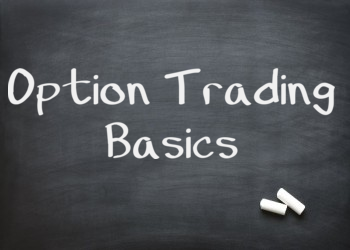 The total cost of the trade is going to be the difference between the price of the two options. In this trade we will be picking up the 1870 put for around $27 and selling the April 1850 against for around $20. The net cost of this trade is $7. Keep in mind, option prices are quoted 1/100th the actual cost, so our total capital outlay would be $700. The maximum reward is calculated by looking at the difference between the spreads and the total cost of the trade. Since the spread difference is 20 points, the maximum reward is $13. Keep in mind: that is your payout at expiration. 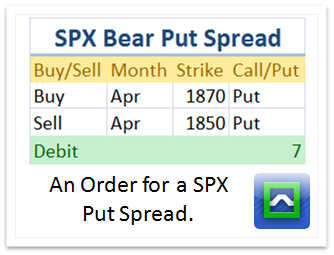 An overlooked part about bear put spreads is that you can use the option skew to your advantage. Simply put, the option skew exists because investors are willing to pay more (on a relative basis) to buy protection against extreme downside rather than moderate downside. Since the option you sell will always be lower on the "skew curve" it means you are getting a better deal on what you are selling compared to what you are buying. It makes this strategy a good one if the skew is running a little hot but the stock hasn't rolled over that much. It's also makes for a great adjustment for iron condor strategies. Vertical spreads in general tend to be closer to directional stock trades compared to other option strategies. Since you're buying and selling options that share similar characteristics, many of the greeks will cancel out. There are two confusing parts to the greeks here. First, your theta depends on where the stock prices is relative to the strikes of your options. 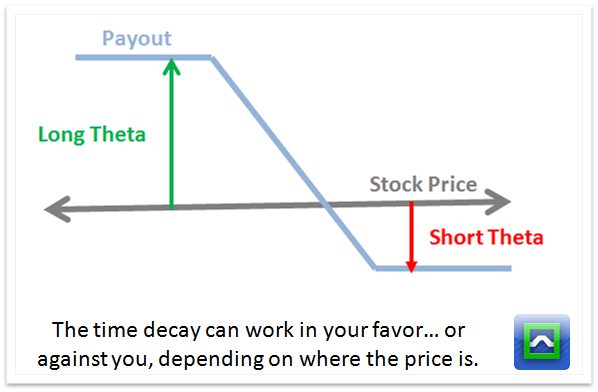 If the stock price is closer to the short strike, you'll have positive theta, meaning you'll make money over time. If the stock price is closer to the long strike, you'll have negative theta, meaning you'll lose money over time. The next confusing part is how sensitive your position is to stock movement. If your spread has a long time to expiration, it will have a much more linear relationship to the stock. But as the position gets closer to expiration, the sensitivity to the stock (this is a greek called gamma) starts to increase. Keep in mind that the gamma increases over time only if the stock price is near the strike price of the options. If the price is far away from your strikes, then your directional exposure (delta) will approach zero and your sensitivity will decline. Think about it this way... if the stock is close to zero, then both the puts will be very in the money and have a delta of 100. If the stock ripped higher, then both puts will be very out of the money and have a delta of 0. Either way, your net position will be 0 as both of the contracts cancel each other out. 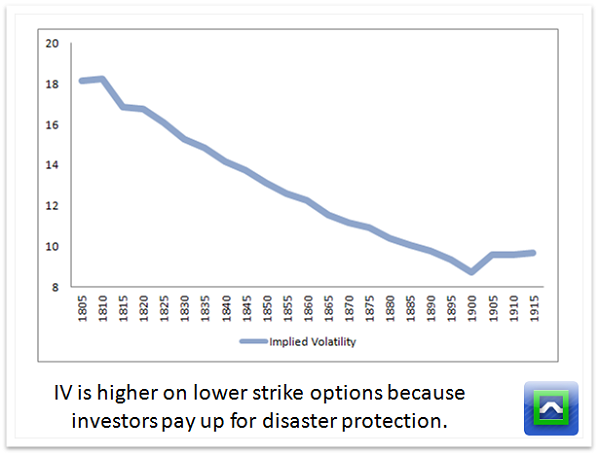 As with any option strategy, there is a ton of nuance in choosing the right strikes. 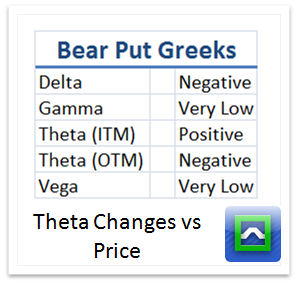 Unlike bear put spreads, straight up long puts offer much more exposure to gamma and vega. That means if the stock collapses in the short term, long puts will be a better bet as the payout on long puts is immediate. The problem with long puts is that they cost more, have more leverage, and have a little more complexity (in terms of the greeks). 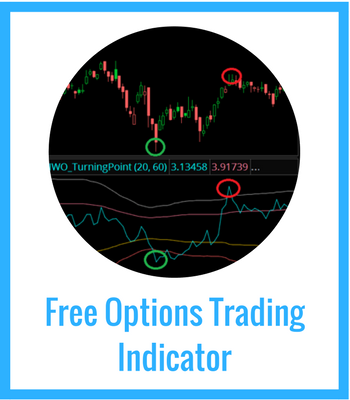 If you are used to shorting stock and want to avoid the voodoo behind options, put spreads are a better place to start. If you choose options that have a long time to expiration, then they will have much less initial directional exposure. This means that the overall risk is lower, but it also means your reward is lower, and it will take time for the profits to come through in your position. But if you take on spreads that are very close to expiration, sure you can end up with some really nice profits... but those profits can swing wildly if the stock blows past your long puts and you end up with a trade "that got away." Another issue with dealing with near term spreads is that the premiums available to sell won't be that high, so you may not be getting much of a deal on the short option in your spread. It may be a better choice to just load up on puts, and then roll into a spread if it works in your favor. Because lower strike options will have less premium available. 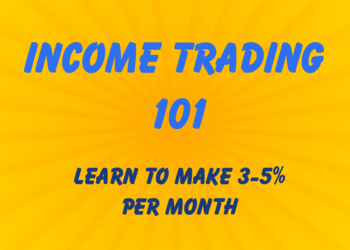 the net cost of your trade will go up if you choose a wider strike spread. The tradeoff here is that your maximum reward becomes much higher. There does come a point in which going so far down for your short option that there isn't enough premium to really justify putting on the spread, and the trade will act more like a long put rather than a normal spread. When choosing your short option, you should probably not go past a 20 delta short option. There's a temptation to try and start on the positive theta side of the trade by picking up an in the money put spread. Of course, by doing this it cuts down your return and increases your risk... but the payoff is higher odds. The problem here comes down to execution. Trying to buy option spreads on contracts that are in the money is difficult simply because liquidity dries up and the bid/ask spreads become a little wider. If you're looking for a positive theta trade that is bearish on the stock, consider a bear call spread instead.